We are able to provide instruction in all aspects of learning to rock climb including coaching movement skills, ropework, belaying, lead climbing, anchor selection, abseiling and using guidebooks. Whether you are a complete beginner, have only had experience in indoor climbing walls or are already leading your own rock climbs we can tailor make a programme for your maximum development as a climber. Our ethos means we will try and provide you with positive and educational experiences whilst ensuring we pass on the wisdom of our own hard won experience. The venues below all provide excellent opportunities for both teaching and guided ascents of classic routes. Please get in touch if you wish to arrange a course at an alternative venue. Many gritstone crags in the Peak District and Yorkshire for example are great places to start your climbing career and we can arrange an intro weekend in that area for you. 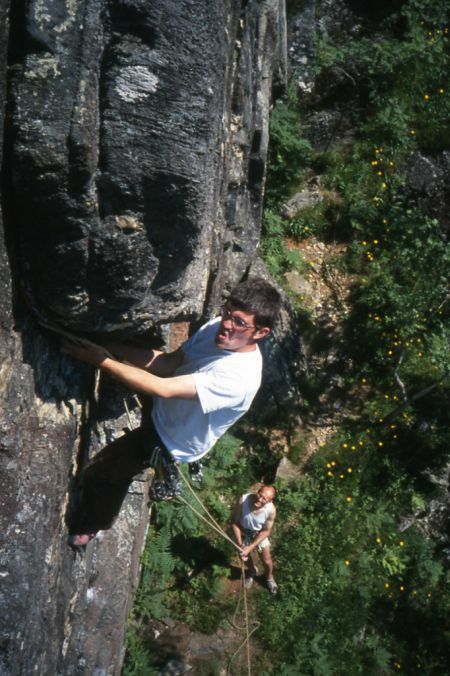 Lochaber, The Cairngorms and the North West – some of the best rock climbing in the UK. Check out the Scottish section in ‘ Classic’ and ‘ Hard Rock’ for inspiration. Try a week based in Lochaber and visit Glen Coe for the soaring and exposed Agag’s Groove. Enjoy one of the classic, big ridges on Ben Nevis or for something harder the brilliant HVS, ‘Centurion’. Ardvereike Wall on Binnein Shaus is probably the best Hard Severe in the UK and the cragging down Glen Nevis or out at Ardnamurchan is in a similar class. We can arrange 5 day or weekend courses based in Fort William or more mobile week long courses visiting a number of different areas in the North West including the sea stacks such as the Old Man of Stoer and the Old man of Hoy. Get in touch for details. Snowdonia is a national park seemingly designed with rock climbers in mind. It contains a fantastic diversity of rock type and thus climbing style and difficulty. A week based here could involve anything from the brilliant, slabby, 3 star V.Diffs in the Ogwen Valley to steep, modern, sport climbing on the tidal sea cliffs of Pen Trwyn. It has been said the history of British rock climbing is written across the walls of the magnificent and open book like crag, Dinas Cromlech. Come along and see for yourself why routes like Cenotaph Corner, Cemetary Gates and Left Wall are so famous. If the weather is good a day or two can be spent at Cloggy – nestling high on Snowdon’s north face this is one of the best mountain crags in the UK. With less favourable weather almost equally good climbing can be found near the coast at Tremadog or Gogarth. North and South, Wales is blessed with simply brilliant rock climbing and, particularly on the coast, the sun often shines too! For intermediate to advanced rock climbers who can second climbs up to HVS and perhaps harder, check out our Welsh Sea Cliffs 6 day course. This aims to spend half the time on the wonderful white walls of Pembroke and the rest on the majestic Craig Gogarth and Rhoscolyn on Anglesey. With a dry week you will certainly be ready for a rest day after this feast of fantastic, steep 3 star rock..